Boasts a reliable metal construction. Holds a full strip of 210 staples. Has a 20-sheet stapling capacity. This fashionable chrome stapler with blue accents boasts a reliable metal construction to provide long-lasting stapling performance. Its stylish, modern design offers a fresh alternative to dated, traditional staplers. Holds a full strip of 210 staples and has a 20-sheet stapling capacity. Limited 1-year warranty. Product number SWI-87830. Ideal for professional use. Stands up on end to save space on your desk and make it easy to grab. 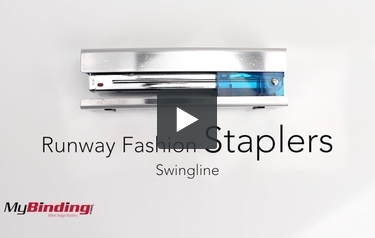 These are Runway Fashion Staplers by Swingline! When you first purchase the stapler, you'll notice a clear plastic protection on it, you'll want to remove that. It comes in chrome, red, and even a navy blue. To add staples, hold the base and lift on the top of the stapler until it stays open. Then place in a strip of standard or premium staples. The stapler opens more by pulling apart the base and the metal shaft, but it doesn't open enough to staple straight onto a wall or other flat surface. It can staple up to 20 sheets at a time as seen here. There are two small rubber pads on the bottom to keep the stapler from sliding around. Stapler is made out of a plastic interior surrounded by metal. If you like coupons and extra deals, sign up for our weekly emails that sends out just that!